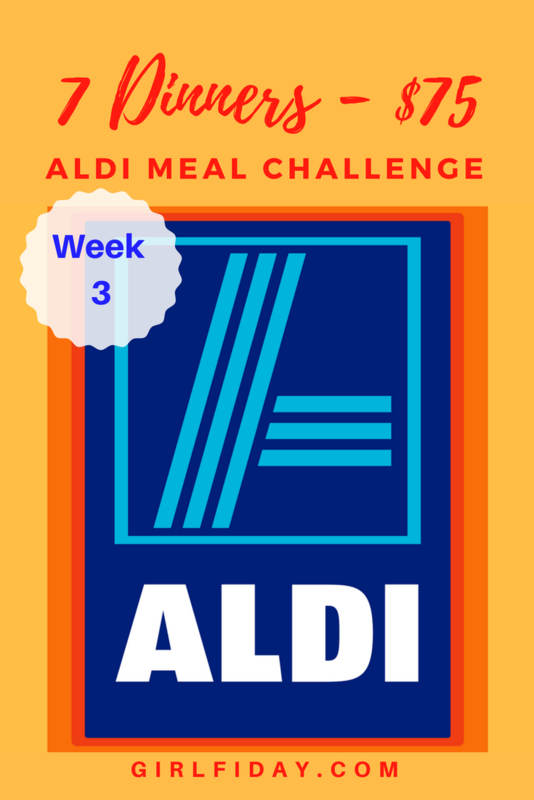 Are you as excited as I am about week 3 of the Aldi Meal Challenge? Well, you should be – because I know what’s coming and it’s going to knock your socks off. This week we tried a couple new recipes – which is always an adventure – but I think there are several keepers. All inexpensive, full of flavor and good for you. But the point of this challenge is the keep the budget under control AND eat well…Let’s see how we did. We did fantastic at ALDI’s this week. Kept the price tag at $45.20. Yup! Almost $20 under the goal. There were a couple items I had to buy at a different store – but that is only because I needed vegan products. For the recipes below I will provide options for both. Either way – your budget should be well under the $75.00 this week. Meal Three: Tex-Mex Potato Corn Casserole (I will be posting a recipe for this dish on Friday – so be sure to check back!) with a green veggie of your choice. 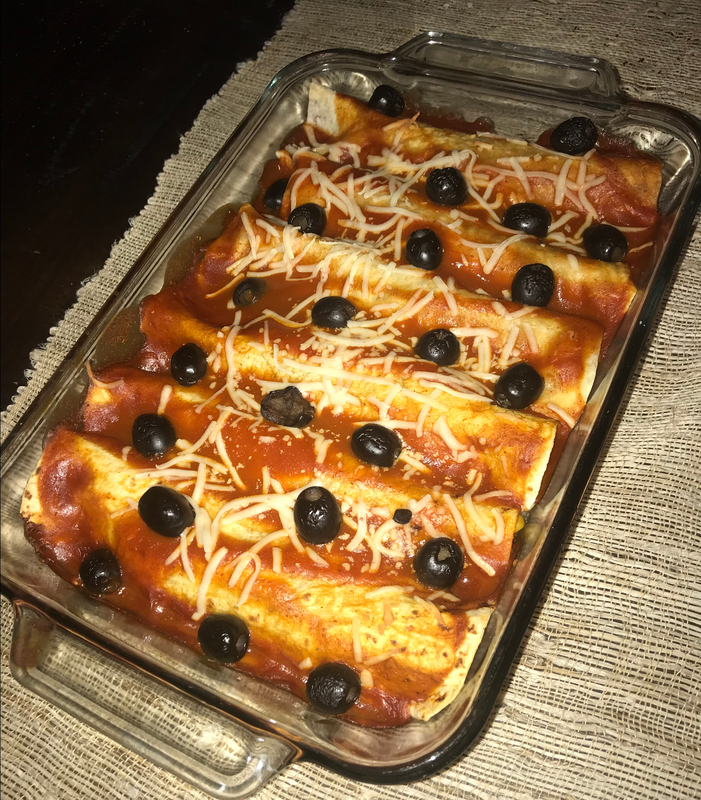 Enchiladas are seriously one of the easiest dinners to prepare. It’s one dish, filling and feeds a lot of people. This week we used flour tortillas, but you could use corn if you like. Also, I add a can of tomato soup to the red enchilada sauce to make the sauce a tad thicker and to tone down some of the spice. Mix enchilada sauce and tomato sauce together. Put one to two large tablespoons of the sauce in the bottom of a 13 x 9 glass baking dish. Take a tortilla and put it in the bottom of the pan to coat the bottom side with the sauce. Spoon a heaping spoonful of your meat mixture into the tortilla and roll. Do the same thing with the rest of the tortillas until your tortillas and meat are gone. Pour the remaining sauce over the top of the dish. Bake at 350 degrees for about 20-30 minutes until heated all the way through. Top with cheese and sliced black olives during the last few minutes until melted. Whether its zucchini and yellow squash roasted, or assorted bell peppers sautéed with onion and garlic in olive oil (or all of the above) , putting a bunch of yummy veggies in a taco is scrumptious. The trick to Spanish rice is slightly browning the rice in olive oil before adding water. While its browning, season to taste with chili powder, paprika, cumin, garlic powder, onion powder and salt and pepper to taste. Pour water over the rice (two cups to every one of rice). Add a can of tomato sauce and stir. Dump in a bag of frozen peas and carrots or mixed vegetables. Bring to boil and then cover and reduce to simmer for about 10-15 minutes until rice is tender. Here is a point of debate in my house. My husband insists that you must add in Knorr tomato bouillon when you add the water. I do not because it has chicken stock in it and I think it tastes great without it. He disagrees. So, when he makes the rice, he adds it. And when it’s my turn to make the rice, I leave it out. Either is fine in my book. Seasoning a pork roast and letting it crock all day, is about as stress-free a dinner you can have. You put it on in the morning, leave it and the smell will cause you to do a deep inhale and exhale as soon as your nose hits the door. For BBQ pork, after it has cooked all day, pull it apart with two forks. You may need to drain some of the liquid. Then either mix in or top with your favorite BBQ sauce. ( I prefer mine all mixed in, but that’s up to you.) Serve on dinner rolls with a little bit of coleslaw….mmmmm…mmmm…good! Our other family favorite (that sadly I haven’t had since we stopped eating meat) was always a hit at get-togethers. It’s perfect for a large party or any gathering, really. Or a Sunday when it’s a little chilly out and you’re huddled up on the couch watching the game. That’s just about as perfect a day as you’re ever gonna get. Put the pork roast in the crock, pour out half the juice of a jar of pepperocini’s and then dump the peppers and the remaining juice over the roast. The original recipe called for a can of beer to go into the pot, but you can use a cup of water with beef bouillon and it still tastes AMAZEBALLS. Add pepper and salt (optional) and let cook all day. It’s done when you can pull it apart with a fork. Shred with two forks and its ready to go. Serve on a dinner rolls (or any kind of roll, bun, or crusty bread) with mayo and provolone cheese. The sauce will drip down your arm and you will not care one bit, because it’s that good. For Pizza Friday this week, we changed it up and decided to give homemade calzones a try. Seriously, I have NO IDEA why we did not do this sooner. They were SO STINKIN” GOOD! I fully made a pig of myself and am not ashamed. So easy too. For the pizza crust, there are several options you can try. Make your own dough by hand or using the dough setting on your bread maker. This Friday, we intended on making the dough in the bread machine, but the day got away from us, and we ended up using the pop-canisters of pizza dough in the biscuit aisle. One can will make two large calzones. The price was a bit more, but still way cheaper than take out. Roll each portion of dough into a circle, fill one half of the circle with spaghetti sauce, and whatever else you want…cheeses, sundried tomatoes, olives….So many options. We ended up using Gardein crumbles in spaghetti sauce, with some chopped olive and a tiny bit of vegan cheese slices and herbs…Oh.my.word….It came out to less than $2.00 a calzone. Not bad for full bellies on a Friday night. I hope you enjoyed this week’s meal suggestions as much as we did. If you have any meal ideas or variations to any that I have suggested – I would love to hear them! So many yummy recipes! I’m trying to get my family to eat more veges (I’m told we need to eat 5 cup of veges). Some of your recipes are so easy to incorporate veges into the meal. Let me know how it goes. Most of my little ones eat them without hesitation. We never fed them special foods (with the exception of my son with special needs – we try, but that mostly is a fail. He likes only food that are varying shades of white-tan. LOL) so they don’t know any better.